You can add our Google Docs add-on from the G-Suite Marketplace. 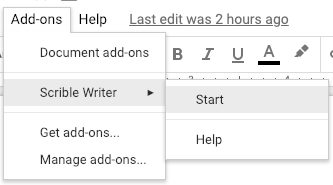 After adding the Add-on, open a Google Doc and select "Add-ons"->"Scrible Writer"->"Start" to open up the sidebar. The first time you do this, you will need to connect to your Scrible Account. Just click the blue "Connect to Scrible account" button. A window will open for you to sign-in. After you sign in (or if you are already signed in) it should transition in a few seconds to a page saying you have successfully signed in. You can then close that tab. If the add-on is still showing the Sign-in screen, close it and re-open the Scrible Writer add-on and you should be signed in. If during the connection step, you see a message saying that a token expired, return to the Google Doc, close the Scrible Writer add-on sidebar and reopen it and try again.